The Ashtabula County Health Department continues to be actively involved in emergency preparedness planning for Ashtabula County. We coordinate our plans with the other Northeast Ohio health departments, hospitals, emergency services, law enforcement, fire departments, schools, the American Red Cross and other related agencies. This planning prepares staff for responding to a wide range of emergencies such as: natural disasters, severe weather conditions, environmental emergencies, chemical disasters, disease outbreaks and mass casualties. April 2016 Ashtabula County Health Department participated in a virtual exercise with regional partners with the focus on Epidemiology, Public Information, Medical Countermeasures and Fatality Management. July 2016 Ashtabula County Health Department was on alert during the Republican National Convention hosted by our partners in Cleveland. September 2016 Ashtabula County Health Department participated in the Perry Nuclear Power Plant Full Scale FEMA Evaluated Exercise. 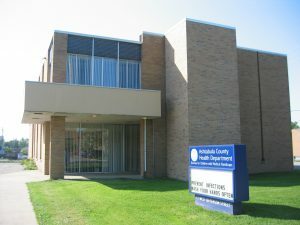 November 2016 Ashtabula County Health Department held a First Responder Functional Exercise which tested the Medical Countermeasure Plan. Being prepared for any emergency, whether it is a house fire, power outage, snowstorm, disease pandemic or terrorist attack requires planning. We urge members of the Ashtabula County community to take the time to work out a disaster plan and to gather supplies to keep in your home and workplace. It is important to include your household members in this plan so that everyone will know what to do, where to go, and how to communicate in an emergency. Human capital affects disaster response. The ability to have trained, credentialed and badged volunteers for a disaster beforehand is a major advantage. When the disaster strikes the clock is ticking to respond to the situation and that response can be delayed if resources such as having trained volunteers are not available. If you are interested in becoming a trained Medical Corp Reserve member for Ashtabula County please select the Ohio Responds link and gather more information and register today. The Medical Reserve Corp (MRC) needs medical and non-medical volunteers. Please call Maria Walker at 440-576-3023 x120 if you have questions. Please use the preparedness links above to gather valuable information.